We’ve been finding more and more reports of gender imbalances in makerspaces. This is something we’ve been conscious of since we built our space, so we’ve taken various approaches to attempt to create a space that’s inviting to all genders and non-binary folks. Mixture of technologies- Our makerspace contains equipment that has been traditionally gendered male, such as the soldering station, 3D scanners, 3D printers, as well as those that have been traditionally gendered female, such as the sewing machine, quilting tools, and the Silhouette Cameo electronic cutter (which is commonly used as a scrapbooking tool). Our hope has been that by having all of this equipment in the same inclusive space, those who may have been reluctant to use something they may have originally thought wasn’t for them, will realize that these are tools for everyone. Mixture of making- While we are big fans of 3D printing- electronic technology-assisted making is not the only kind that happens in our space. We have a table of painting supplies right by the entry of the space, coloring and drawing supplies on a cart outside the space, as well as collage supplies available to use. Mixture of people- Our space and the student makerspace club are led by people with a mixture of gender identities. 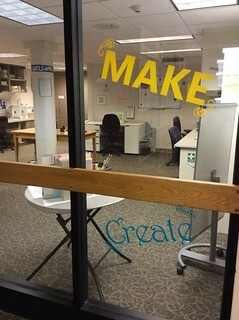 Mixture of academic disciplines- We try really hard to include all academic areas of study when reaching out to faculty and students to use our makerspace. We’ve worked with a pretty wide range of courses and are actively pursuing more. Mixture of decor- It might sound trivial to some, but the look of a space can create a gendered feel. We’ve attempted to add signage and decorations that are welcoming to all and that represent a wide range of tastes and visual preferences. We’re going to try harder to bring in more academic disciplines- especially those that do not traditionally work with technologies. We also plan to reach out to diversity-oriented student organizations and committees. In regard to makerspace tools and supplies, we plan to work with more fiber arts (including yarn crafts and 3D printing on fabrics) and come up with a wide variety of examples for use when we get our laser cutter. This entry was posted in 3D Printing, Advice and tagged gender in makerspaces, makerspace management on June 22, 2018 by Angela Vanden Elzen. More Virtual Reality at Lawrence University!